When I arrived in Australia in July 1995 as a Kurdish refugee from Iranian occupied Kurdistan, just Like Reza Berati, it was then that I learnt the definition of compassion and what Einstein meant when he said to break free and widen our compassion. As a five year old child who had experienced what most people only see in their nightmares, without any understanding of the English language or Australia, I was completely overwhelmed by the language of compassion. Before my teachers, mentors and newly found friends taught me how to speak English, they taught me the language of love. I will never forget the flight attendant who sat with me through a 14 hour flight, played with me, fed me and made sure I felt safe because my eight-month pregnant mother couldn’t, or was probably more scared than I was. Arriving in an alien country, where we had already crossed several borders to get to only to arrive in a worse place every time, the fear of war, persecution and death was our shadows. Yet the organisations which gave us a home, the neighbour who baked us welcome biscuits, the hundreds of Australians we saw everyday who welcomed us into their communities, into their homes and mostly importantly into their safe and beautiful country. I am here with you today because of the generosity, compassion and love of those people. I remember having to call a taxi for my mother who had just entered labor and neither my father, myself nor my mother knew a word of English. Except for please and thank you. Yet I will never forget the compassion and determination of the stranger on the other end of the line who managed to get a taxi to us in ten minutes and to the hospital in fifteen, where my Australian-Kurdish brother was born. This is the Australia I know. This is the Australia I love and this is the Australian that I aspire to be every day. Now as a citizen of Australia I spend every waking minute giving back to the community and country that gave me so much. I take every opportunity as a treasure of gold, every second chance as a re-birth of my life. Simple everyday things like speaking Kurdish at home, wearing my Kurdish clothes, flying the Kurdish flag alongside the Australian and Aboriginal flags, celebrating my culture and tradition. All of these things for me are a minute of peace and bliss. The same activities back home in Iranian-occupied Kurdistan would have me captured, imprisoned and executed, most probably without trial. This is what dear Reza was fleeing from. He was fleeing from the prison that had become his home and the death that had become his only friend. He was in search of a better future and better life, in country that is the land of opportunity for all, not just for some. In a country that has the reputation of being one of the friendliest countries in the world. It breaks my heart that Reza and many others like him are not able to experience the Australia that I have, but instead experience the ideals of a few whom think they represent us all. I love this country too much to allow it to be represented this way to the world, to allow it to hurt so many. I will fight, in the name of Reza and all refugees and I will not rest until we never have to gather in these circumstances again. Reza’s last name was Berati which means ‘Brotherhood’ in Kurdish. I will fight for the Berayati that he was in search of. If you will bear with me I would like to say something in Kurdish in Honour of our dear Reza. Bo benamalay Kak Rezay barez u xoshewit tasleyat ajim, how xamu how dard lagal tan. Bo Reza gyan, roht har shad be u hamisha le dlimana biji guli Kurdistan. We’re here tonight in honour of a man we don’t know. What we know of Reza Berati is this – he lived in Iran as part of a persecuted minority group, he was a Faili Kurd. He was 23. We know he left his home and family in search of a better life – safety, peace, opportunity. We know he took great risks in this search for freedom – including the risk of coming to Australia by boat. We know he came to us to ask for protection. We know that instead of protecting him we sent him to a prison on Manus Island. A place not designed to protect people, but to break them. Even before the night of horror on which he died, we had failed to protect Reza – and thousands of others. Tonight, we’re here to mourn for Reza. We’re here to mourn the loss of his life – another tragedy caused by our nation’s intentionally inhumane policy. We’re here to stand in solidarity with those who remain trapped behind fences intended to break their spirit. We’re here to honour the memory of Reza and all those who have lost their lives in the search for freedom. We’re also here to mourn for our national character and the continuing erosion of our values. For two decades, we’ve been told that cruelty is the only way to address the complexities surrounding people seeking asylum. We’ve witnessed a shallow political debate that has seen our national character damaged to such an extent that an election could be fought – and won – on the promise of greater brutality to the world’s most vulnerable people. This is the natural outcome of our addiction to the politics of fear and division. But I don’t want my children to grow up in a nation where cruelty has been normalised. Where transparency is only valued when it serves a certain political agenda. Where the death of an Australian citizen is more worthy of grieving than the death of any other human being. What I do want is leaders who see their role as amplifying the dignity of every human being. Leaders who will show my children that courage is not measured by your commitment to cruelty, but by your commitment to humanity no matter what the political cost. Leaders who will model welcome, inclusion, kindness and compassion. We need people who don’t lead from their commitment to their ego and ambition but from their commitment to a vision for a better world. Leaders with a conviction that no matter who you are, where you come from or how you got here – you’re a human being deserving of all the same rights, opportunities and respect that they themselves lay claim to. We didn’t know Reza, but we feel the depth of his passing so deeply because we know we are complicit in it as a nation. A young man came to us for protection and we failed him – not by accident, but by intentionally placing him in harm’s way. We used this young life as an example to others of what could happen to them if they came to us with the same request he did. We speak a lot about how the political debate has dehumanised asylum seekers. The death of Reza Berati shows us the extent to which we have dehumanised ourselves. 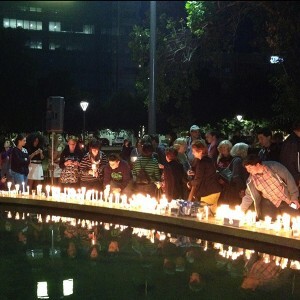 Tonight we mourn for Reza, we light a candle in solidarity with asylum seekers still suffering in our detention centres and in the legislated destitution of bridging visas – and we grieve for the damage done to our own humanity, the character of our nation and the values those of us gathered here hold dear. Let’s now pause for a minute’s silence to remember Reza Berati and all of those we have failed to protect. There is a memorial to Reza that you can visit as this vigil draws to a close, where you can write a message of remembrance, place a flower or pause to further reflect. Please leave your candles around the memorial as you leave. Although this is a sombre, night, it is not without hope. 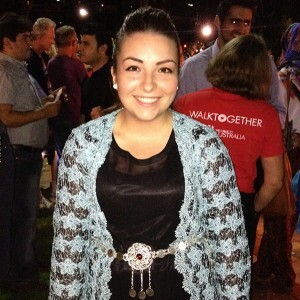 All over Australia, thousands have gathered at more than 750 vigils to remember Reza and also as a symbol of the nation we still believe is possible. A nation where all people are seen as equals; where compassion is more laudable than cruelty; where welcome, inclusion and generosity characterize our political conversation, public policy and interpersonal relationships. There is an Australia not reflected in our media, or in our asylum seeker policy. It is reflected in the fire of thousands of candles burning tonight. It’s seen when any one of you turns your values into actions by helping a new Australian feel welcome in your community. It’s wherever we reward compassion with our vote. It’s wherever we offer belonging and friendship to people with different backgrounds or beliefs to our own. This is the Australia that is possible, and it is taking shape in communities all over our nation tonight and as we live out these sentiments in our daily actions, attitudes and relationships. Thank you for tonight shining a light in the darkness. Each one of you is a light of hope for a better tomorrow. New Internationalist magazine #469 – Why are we locking up migrants? New Internationalist blog – Will the death of Reza Berati mark a turning point for Australia? This entry was posted in Activism, Asia-Pacific, Refugees and tagged activism, asylum seekers, indefinite detention, iran, kurdish, LightTheDark, Manus Island, operation sovereign borders, politics, refugees, stop the boats by Brian Loffler. Bookmark the permalink. I feel that the antagonism shown by the Australian public towards asylum seekers is driven by fear, fear of being swamped by the many millions of people who live around the world in similar circumstances to those suffered by the current asylum seekers. Any country must control immigration to a manageable level to avoid serious difficulties that would arise with mass, uncontrolled migration. I do not in any way condone the treatment of these people by our government, but I can understand the fear of being “swamped”. I would be interested in your take on my comments. A government that is managing immigration by dumping asylum seekers on such conditions as we have seen in Manus Island and demonizing them to the point that everyone who wants, has access to abuse them and beat them up, having them on limbo for as long as they are useful for political gain, it is shameful. I believe in countries protecting their borders however, the way the government and its supporters are handling the people arriving by boat from Indonesia is cruel and inhumane. If there was justice in our society, Australia should be taken to the Hague for crimes against humanity.